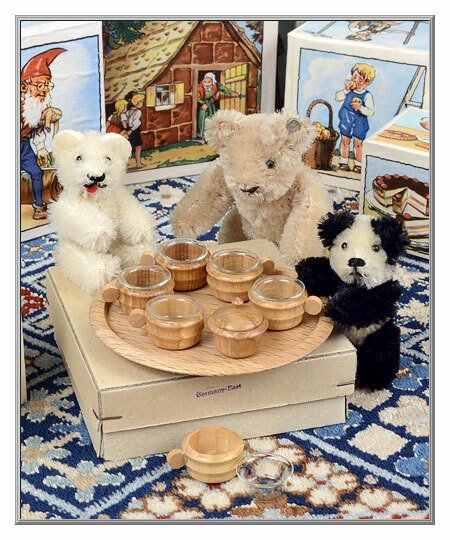 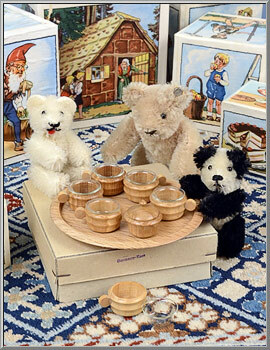 When the teddy bears picnic, they like this set of cups with tray best, because the sugar bowl with lift-off lid can also be used as a honey pot! 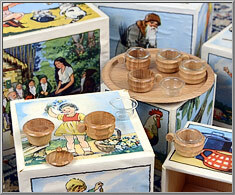 Made in East Germany at least 60 years ago, each turned wood cup is fitted with a mouth-blown glass liner. 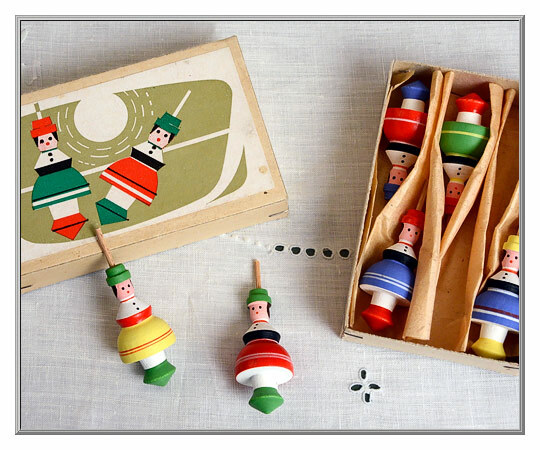 A charming, old-time toy for collectors, all of these vintage sets are still packaged in their original boxes. 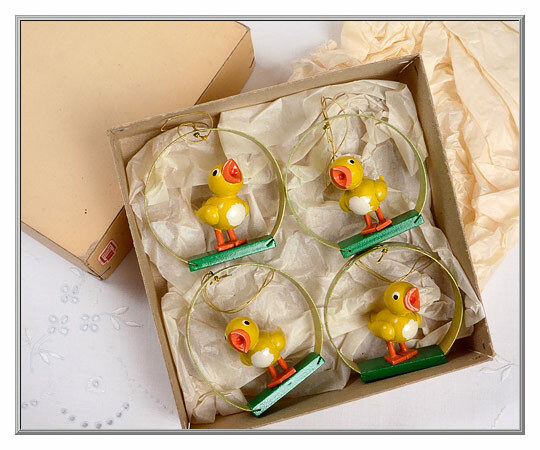 Sold as a boxed set of 15 pcs. 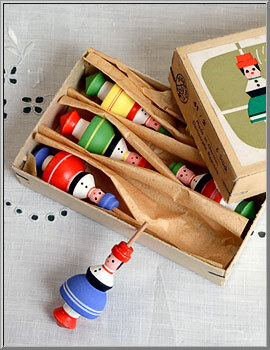 ¾” wide (not including handles). 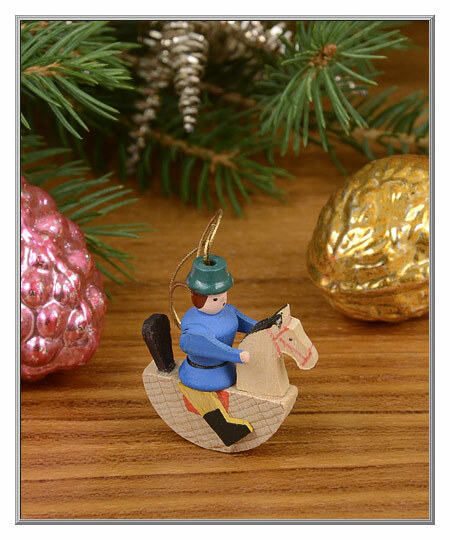 A most charming little fellow to hang on your tree, this young lad riding on his rocking horse was made in the shape of a classic German toy. 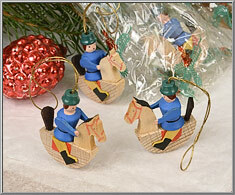 Created using both carved and turned wood pieces, it has hand-painted details. 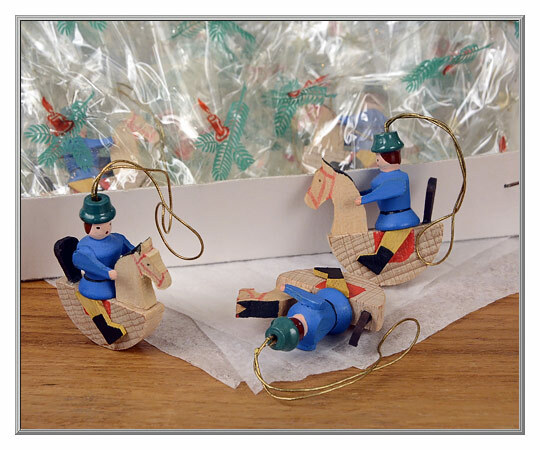 To use as a toy for a Santa sleigh or sack, just cut off the gold hanging cord. 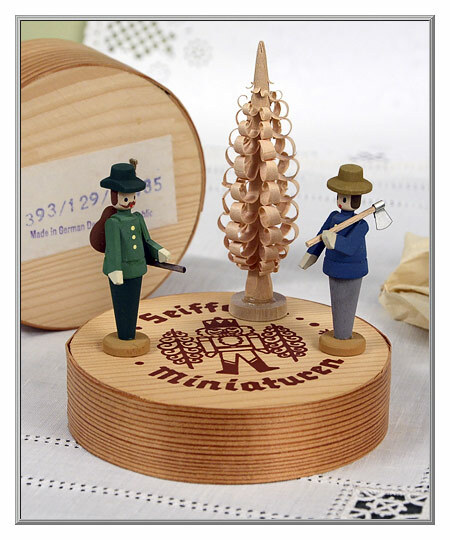 Made in the Erzgebirge region of East Germany in the '60s, it is in mint condition. 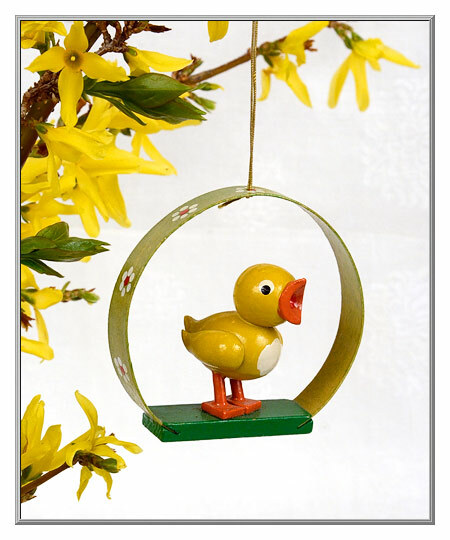 Sold as one vintage ornament. 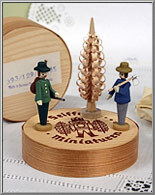 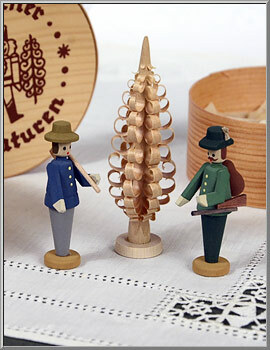 Dressed in German dirndls, these wood doll tops come in an assortment of six colorful costumes. 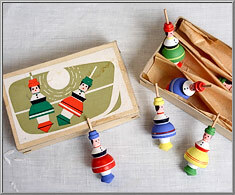 The toy tops really spin - just grasp the spindle, give it a fast twist and watch it go! 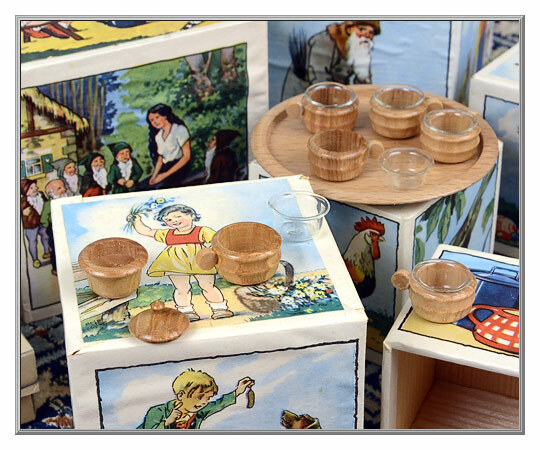 Packaged in the original box, please note that while the decorative boxes may show signs of water damage, the wood toys are as bright, clean and crisp as the day they were made more than 50 years ago. 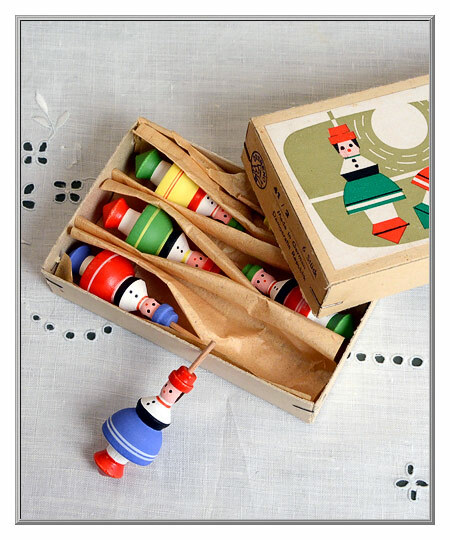 Sold as a set of 6 in original box. 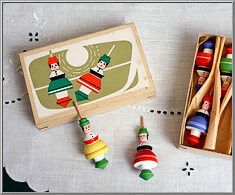 wood spindle handles is 2½" high. 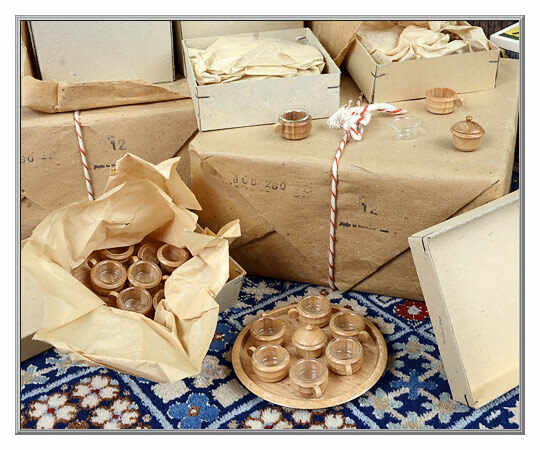 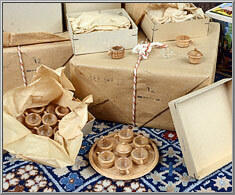 Still packaged in the original decorative ‘Spanschachtel’ chipwood box, this old stock set is in mint condition. 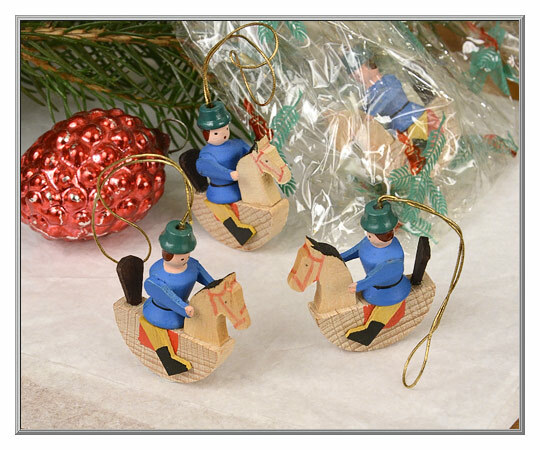 The little men were crafted using a combination of both carved and turned wood pieces, then hand-painted with antique, satin-finish colors. 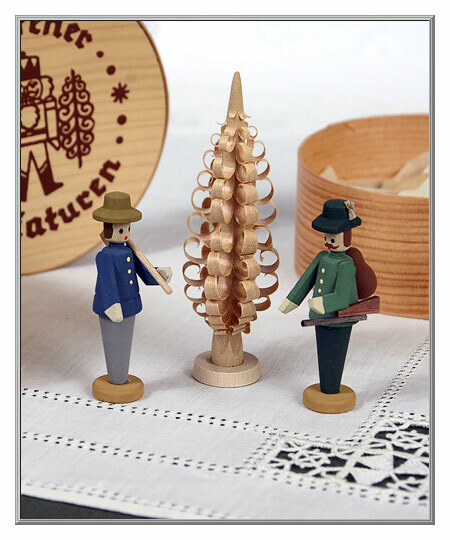 The unpainted pine tree, or ‘Spanbaum’, was expertly carved by a skilled German craftsman. 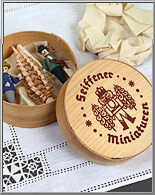 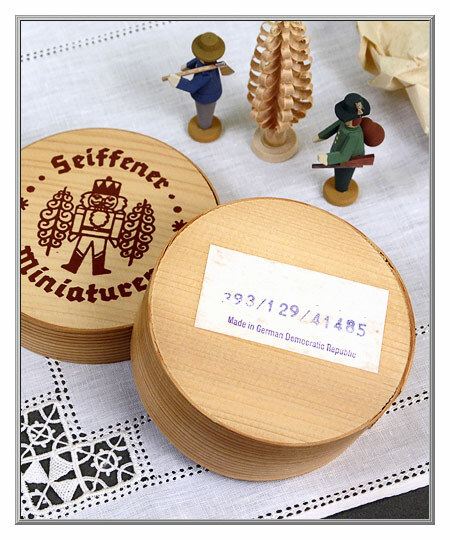 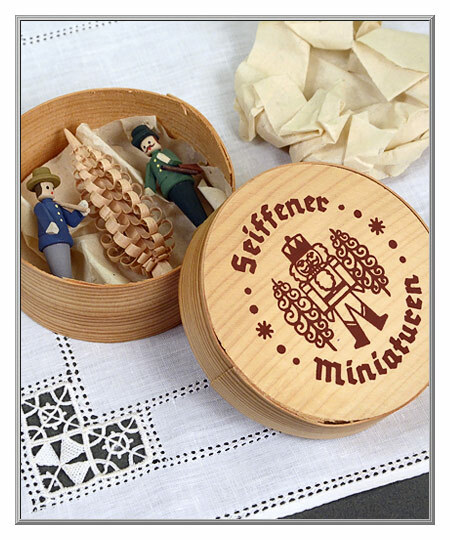 Set is by Seiffener Miniaturen. 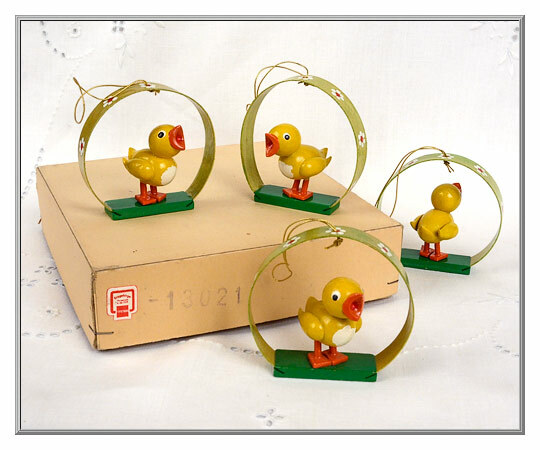 Sold as a set of 3 in wood box. 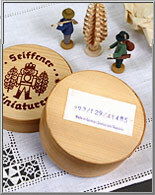 Spanschachtel box is 4" wide. 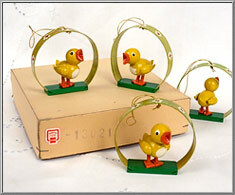 This quartet of bright yellow peeps are as colorful as the day they were made more than 50 years ago. 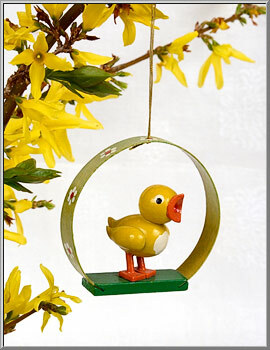 Handcrafted from turned wood pieces, the cheerful chickies perch beneath curved arches of a thin shaved wood. 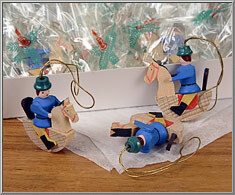 Finished using glossy lacquer paints, do note that the wood arches may have warped slightly over the years. 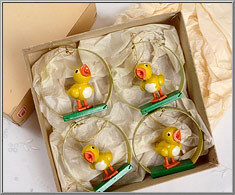 Set of four ornaments comes in the original box. 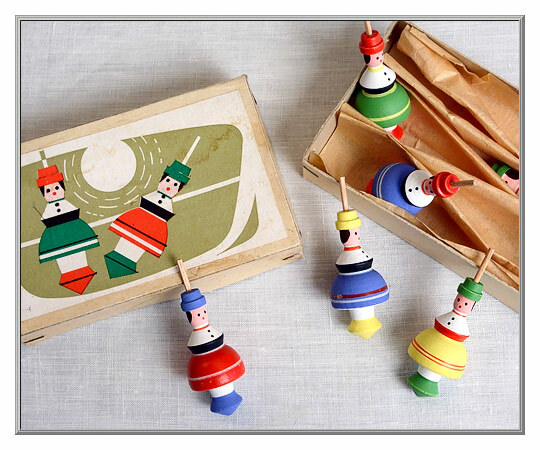 Sold as a set of 4 wood ornaments. 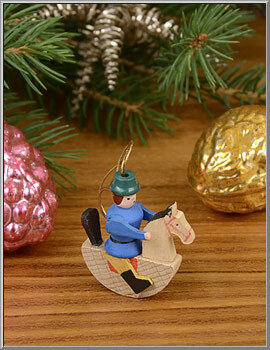 metallic hanging cord is 3" long.